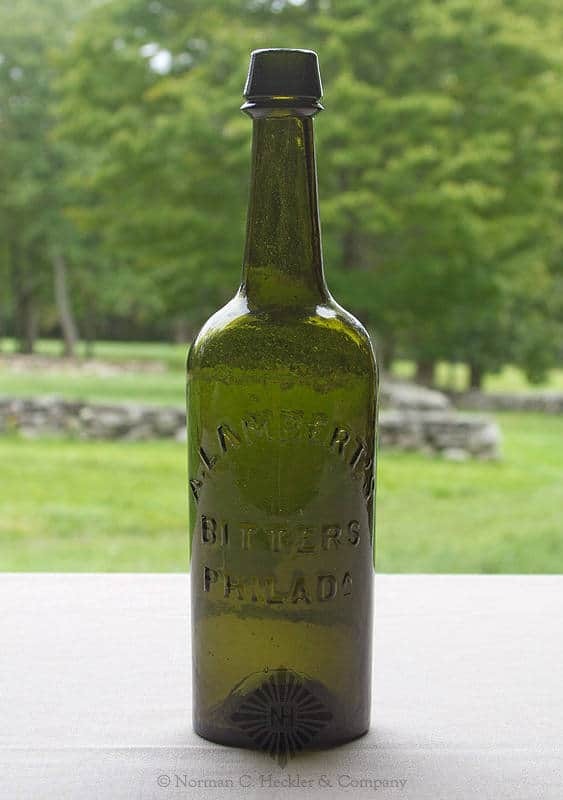 Here is an exceptional example of this exceedingly rare colored pontiled bitters bottle from Philadelphia. It is boldly and crisply embossed “A. 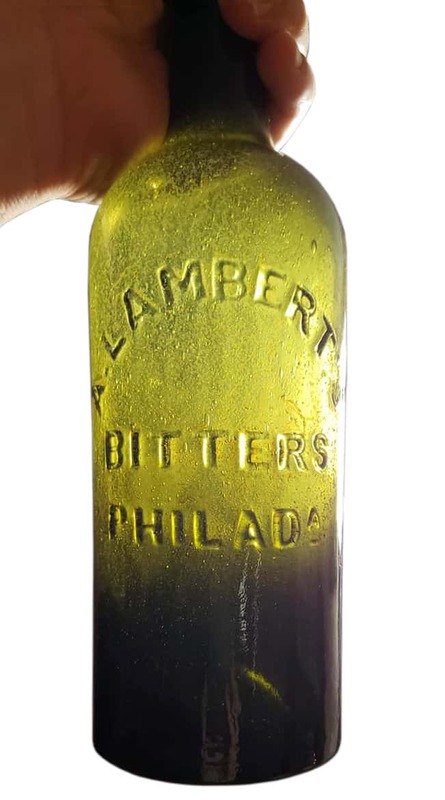 LAMBERT’S BITTERS PHILADa” and comes in a beautiful shade of yellowish olive green. It is absolutely loaded with bubbles and sports a large full iron pontil mark on it’s base. The applied top is slightly off center and large for the size of the neck adding great eye appeal. 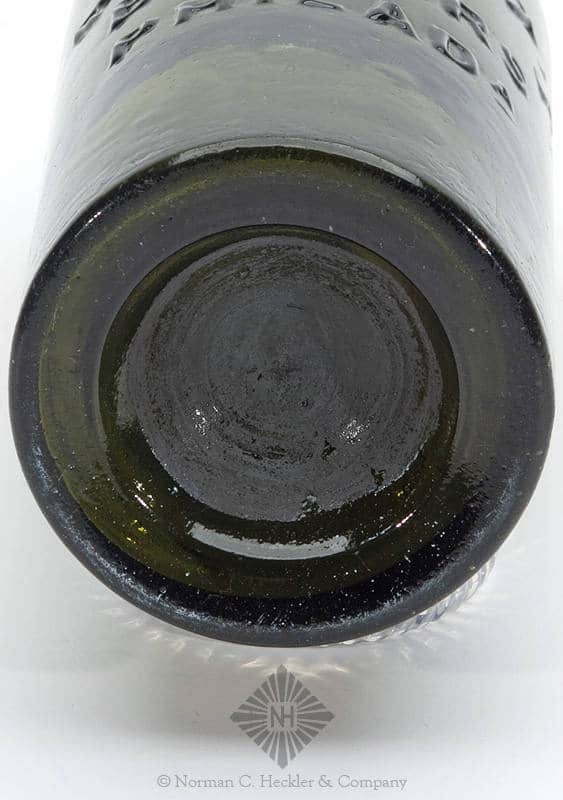 And to make this bottle even better it is a attic example and was never buried or cleaned. It does have a thin coating of dried contents which I’m sure could be washed out. Also dry remnants of cork on the inside of the lip. 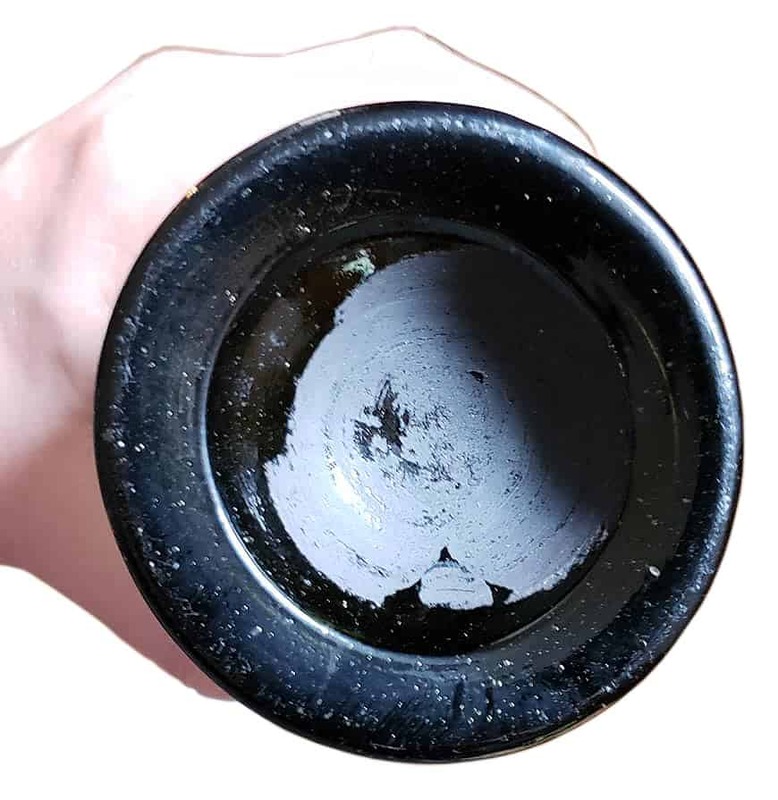 It is virtually mint with a tiny rough tooling mark on the bottom portion of the applied collar (done during the tooling of the collar and very tiny mentioned for accuracy). There are also several very small onion skin open bubbles on the surface. No chips, cracks, or potstones. After doing much research and speaking with other collectors I believe there are only 2 or 3 of these iron pontiled variants known with one being sold in 1995 then again in 2010. The smooth based variant is also extremely rare. $5,950 includes shipping and insurance along with satisfaction guarantee. PM for questions. I now see the bottle is listed on Ebay. Augustus Lambert was born in Germany in either 1826 or 1827. It looks like he came to America alone as I can find no other family members. He could have been located in Baltimore in the 1850s. There is no definitive proof that Augustus Lambert is the “A. 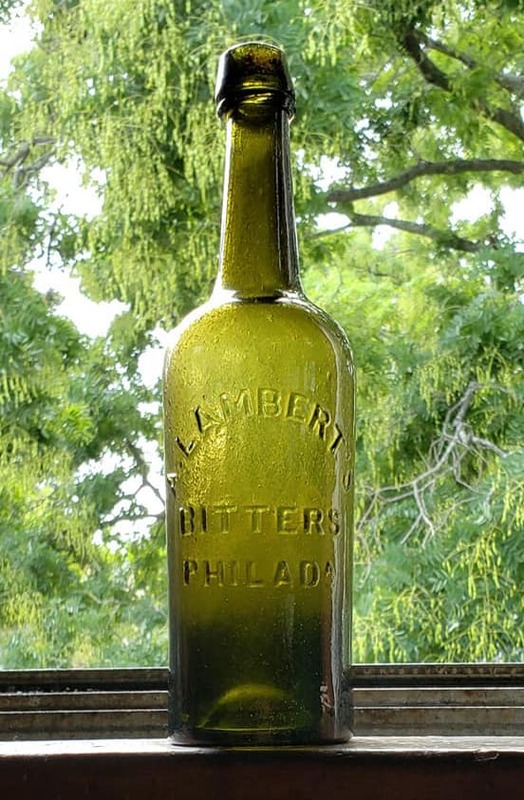 Lambert” embossed on the bottle though he is the only “A” listing in the 1860-1865 time period in Philadelphia. 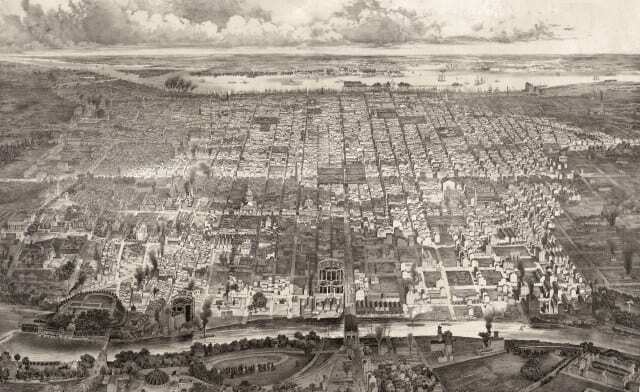 It has to be him as he started out in the hotel and restaurant business around 1860 while importing liquor and wines at 422 Race Street (see map below). In 1863, his restaurant was called the Steam Oyster Saloon. We last see him at SW 4th & Library, in Philadelphia, selling liquor in 1864. He drops off the radar after that. 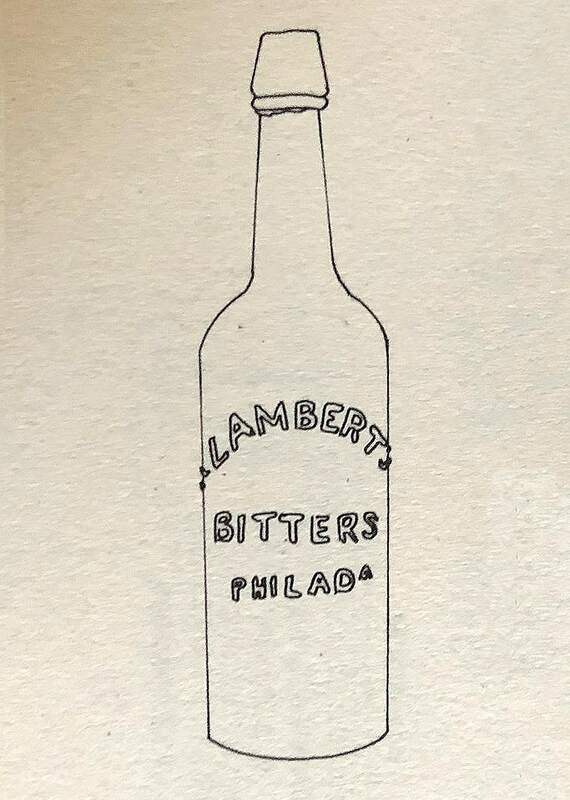 As an aside, there are listings for an Ann Lambert selling liquors on Lancaster Avenue in Philadelphia around 1872. Had it been Ann representing the “A” on the bottle, we may have had our earliest female-owned bitters. 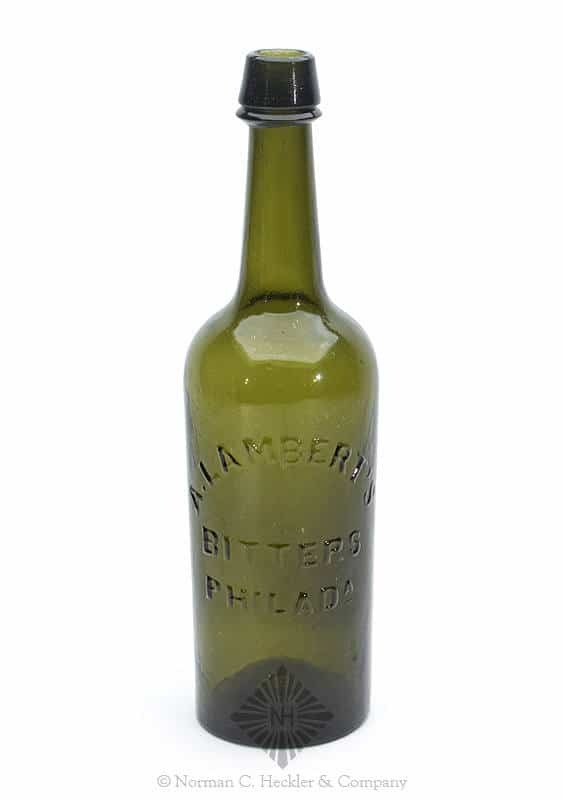 This extremely rare bottle would have been blown at the Dyottville Glassworks in Philadelphia. It would have been loaded with alcohol and probably had little or no medicinal attributes. There are only a few examples known, they are olive amber, have applied mouths and can be found with and without a metallic pontil mark. 1826: Augustus Lambert, Birth Year: abt 1826. 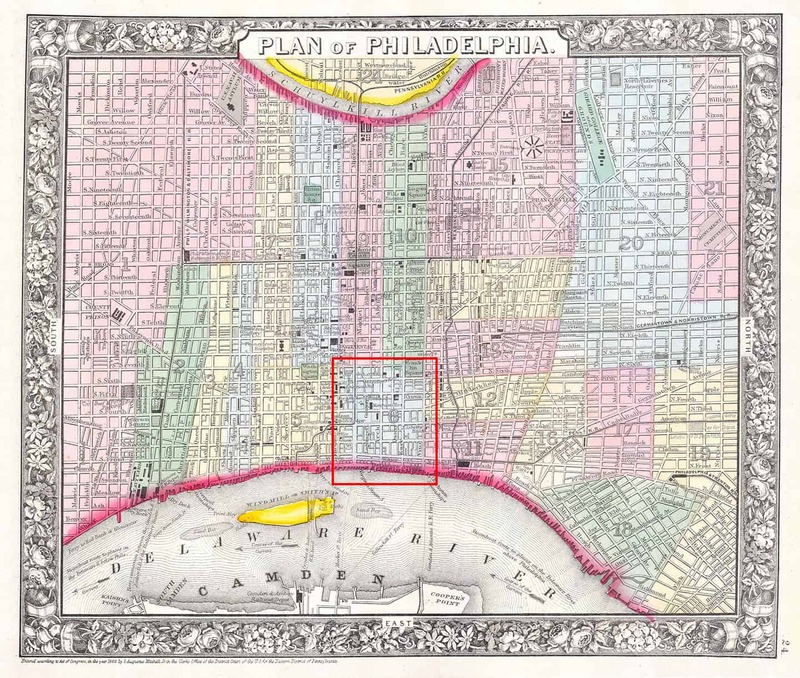 This entry was posted in Bitters, Facebook, History, Liquor Merchant and tagged Ann, Augustus, cylinder, Dyottville, eBay, Hotel, importer, Lambert, liquor, Pennsylvania, Philadelphia, pontil, Race Street, restaurant, Saloon. Bookmark the permalink.